In recent weeks, we have been writing about the pending oversupply of attached dwellings across the country. 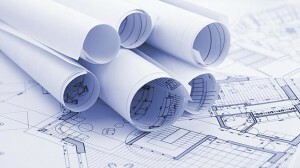 We have also advocated that too many off-plan apartments have been bought by investors. We are not arguing against the trend towards smaller digs, but rather the magnitude of the current supply; where it is being supplied; at what prices/rents & the expectation (across many housing-related disciplines) that inner city high-rise living is a housing cure-all. Some are regurgitating the minimum dwelling size chestnut as a way of controlling residential product outcomes. This is barking up the wrong tree. We seem to be stuck in the traditional-based ‘house versus apartment tower’ mindset. What is missing – from an affordability & liveability viewpoint – are new housing products in-between these two polarised options & importantly located throughout our cities, not just downtown. Living in compact housing is becoming increasingly popular across Australia, due to our changing demographic makeup & lifestyle expectations. We have been advocating such for close to two decades. Adding more weight behind these changes of late is low housing affordability; less full-time work & now, little or no real wage growth. Also, our research is telling us that Australia is about to undergo big changes to its economy & especially its housing market. Many of us may be forced to compromise our housing choices. This will often mean less, especially when it comes to dwelling size. There is nothing wrong with small homes. The overall size isn’t the key measure. Other things are more important. But before we get into what’s more important than just mere size, let’s take a step back & look at the wider picture. Every second household in Australia currently supports either one or two people. And it is forecast that the proportion of one & two person households will rise. 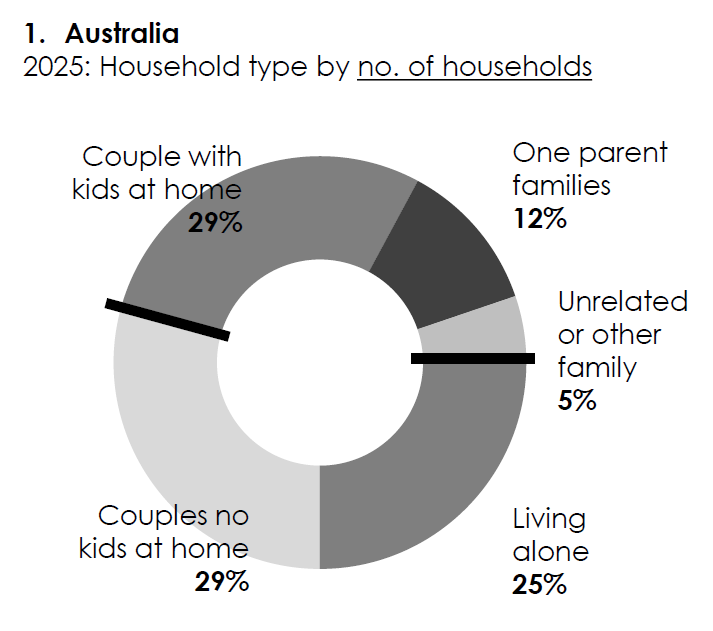 Some estimates are that two-thirds of Australia’s homes will support singles or couples within a generation. We are not just talking about young renters here, but owner-resident households, too. This trend is even more pronounced for aging baby boomers & their First Generation parents. Now, a small household does not automatically equate to a small home. There are plenty of loners or empty nesters living in big homes across the country. But what if we cannot afford big digs in the future? So, as it is with most things in life (& property is no different), money talks. Unemployment is high & rising, plus many more of us are underemployed. Both are projected to increase. Wage growth is now below inflation. It could remain so for some time to come. World deflation, not inflation, due to aging demographics. There is a lot less full-time work going around than there used to be. 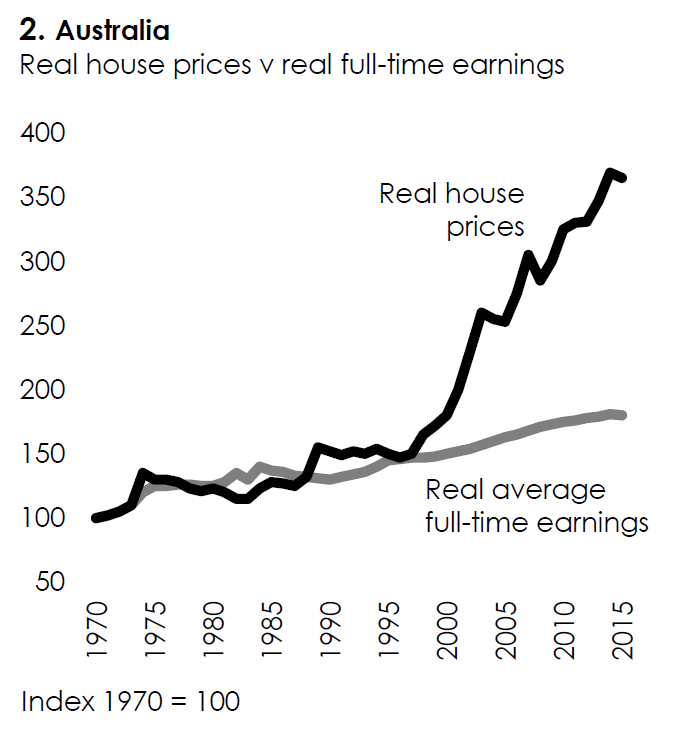 Dwelling price growth is disconnected from wage growth & dangerously so. See chart 2. Australia is vulnerable to any number of external economic shocks. Much needed macro prudential & tax changes are underway. In due course, interest rates will normalise. There is little to no government money for any real fiscal housing stimulus i.e. first home grants. So the broad economics (when looking at things from a dispassionate viewpoint) are stacking up against lavish homes & rapid price escalation in our not so distant future. Our time-short lifestyle is making the increased commute time from ‘home’ to ‘work’ to ‘play’ (whether by car or public transport), less acceptable. The increasing cost of long private commutes (petrol, car maintenance & insurance etc.) & the need for several cars, is making the idea of a ‘go-card’ & public commutes – walking or cycling – more appealing. The lag in infrastructure provision to outlying new suburbs is adding additional strain on a public which increasingly wants more, now. Waiting for things (like neighbourhood services & amenity) is no longer part of our creed. We, as a nation, by and large, seem happy to trade ‘space’ for ‘place’. I often repeat this simple phrase – “density needs to be offset”. If we are going to live in a more compact dwelling space, then that space itself, and very importantly what surrounds it, needs to be better than if our home & private yard was much more voluminous. I am not saying that detached homes are potential dumps or that living on acreage is akin to being in a pigsty, it’s just that the room for error is far greater in tight confines. If I have learnt anything from watching those property shows on Foxtel (the original English versions only, of course! ), it is that space is often working against you when it comes to small builds. One point worth raising here is that we seem to applaud every new high-rise apartment building in isolation (its architecture; its views or facilities), rather than looking at it as part of the whole urban landscape. The ground planes in many of Brisbane’s newly redeveloping inner-city suburbs are just plain woeful. It isn’t just me saying this. Again, money talks & many new restaurants/cafes at the base of these new shiny vertical villages are already closing. Too many of these new apartments are locked up by their owners; & those that are occupied, are often done so by people who can really only afford cheap takeaways rather than the high plate prices that go with running a new downtown eatery or restaurant. And we are also giving away too much of our collective future amenity – like public access to the Brisbane River – to development. But I digress. Compact housing design must be clever in its use of space; finishes; building amenities & services. It cannot be reduced down to an arbitrary minimum number like, say, 50m². One of the keys to better housing investment is to match the aspirations of the resident now & into the future. The most important consideration in any property purchase is who is likely to be the next owner after you. It’s the next buyer who determines your capital growth potential & in most cases, it is best if that next buyer has a better than average chance of being an owner-resident. This is lost, I fear, on too many buyers these days and in particular younger investors. So what are some rules to buying a better compact dwelling? There are basic human dimensions that can only be compromised so far. For example, living areas must allow for residents & guests to move around. One needs to be able to get easily into a bed. You do need to do the three S’s (shower, shave & s… well you get the picture) in a bathroom. Kitchens aren’t just places for George Clooney coffee machines; they need some workable bench space & storage options; good lighting & ventilation. On that note, natural light & ventilation are very important. Often, the perception of space is more important than the actual size or dimensions. Also increasingly important, is energy efficiency. The best way to do that is via natural light & ventilation. Storage is king when it comes to compact living. The better the storage space, the better your tenant & owner-resident resale appeal. Privacy & security are also important, as, too, is car parking. Handling parking provisions successfully is paramount. Finally, in our ever increasingly busy & compromised world, our urban space already has multiple uses, and will need to have more in the future. 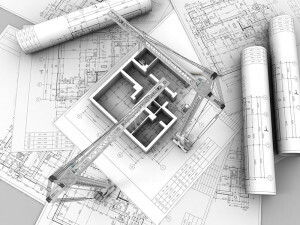 Multi-functional space will become the norm. Do we really need a full-time dining room? Yes, we might want a space to entertain 4 or even 6 guests occasionally, but not every day or even every week. Similarly, this applies to the second bedroom. Why can’t the bed in the second bedroom pull out or fold down from a wall, especially if it is only used on the occasional weekend? In short, it looks like we may not be able to continue to afford all the traditional spaces that once made up our homes. 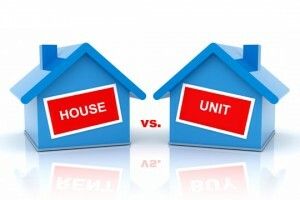 As we stated in our introduction, we seem to be stuck in the traditional-based ‘house versus apartment tower’ mindset. This is especially the case in my home state of Queensland. What is missing are new housing products in-between these two polarised options. We need more townhouses; ‘plexes’; terrace homes; granny flats; small-lot homes & flexible dwellings. These need to be supplied across much of the Australian fabric & especially in our middle-ring suburbs. For mine, we also need one set of rules when it comes to new housing form. This should apply across an entire state or territory. Maybe it should even apply across the country, allowing, of course, for climatic differences. And this set of rules should be more about the factors listed above & not an arbitrary dimension. Also, our experience is that many residents want to ’age in place’. 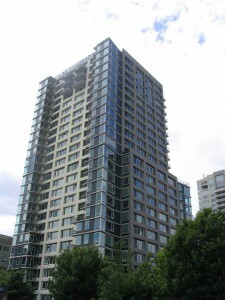 Most don’t want to live in a high-rise apartment complex. They would like to downsize; stay local & have some nexus to the ground. But in the absence of affordable choice, they stay put, often as a couple or even a single person, in large detached homes. This ‘in-between’ housing would also suit many first home buyers; plus, of course, the rental market. 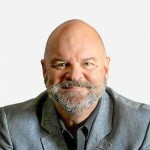 There is a real lack of new housing choice in the Australian market. This is stopping first home buyers. It is stopping empty-nesters from downsizing. It is, by default, oversupplying the new high-rise apartment market & stalling a more sustainable housing building recovery. Current public policy is not allowing private enterprise to supply what the market really wants. Michael, I don’t always agree with your views, but here I think you are spot on. Many older people would be happy to downsize, provided they can reside in the same area. They also want to retain their privacy, so they need just a little patch of garden with minimal maintenance requirements that gives them an opportunity to sit outside in their own space, not in an area shared by 100+ other residents in a residential tower. But would such a housing style still be profitable for a developer?